Hooray! It’s Daddy’s Birthday Today! We always try to make a handmade card for a birthday to show we care. 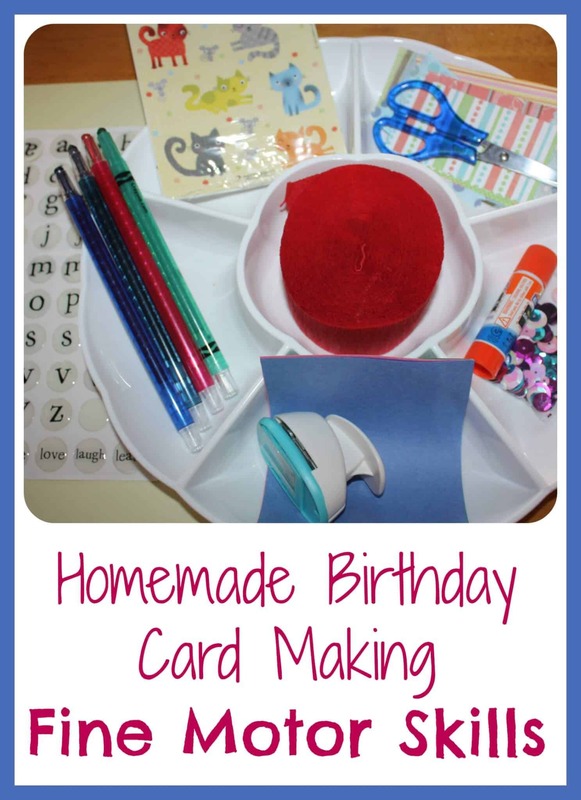 Of course there are just so many wonderful fine motor skills that go into making a handmade card. Although we make cards pretty often, I have never tried a set up like this before to encourage longer creativity. Usually, with Liam, card making is a little bit more difficult to get him really interested in the process. 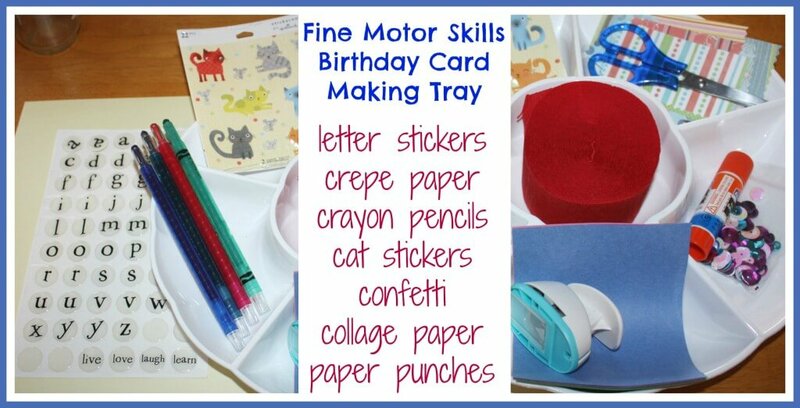 I created this tray with the previous mini fine motor skills tray in mind (here). Each compartment had a mini activity and much like the previous one, this tray has a mini creative step to add to the card. All the while, we practiced fine motor skills. Peeling, sticking, gluing, cutting, punching (paper), drawing, writing, tearing and creating! We used a variety of materials to try out different skills. The idea started as a card but I quickly realized we needed to make it more poster size. I chose a piece of 12×12 scrapbook paper instead. While allowing for creativity, the mini compartments of different creative materials allowed some structure that Liam generally prefers. Finding the right balance is important so that I do not completely direct him but give him the opportunity to take the time to try out different materials and ideas. Each section provided a chance for fine motor skills practice. The biggest direction I gave him was to start with the Happy Birthday letters. I told him what letters he needed and he found them and stuck them down. Stickers make a great fine motor skills practice tool and kids love them too! We also worked on lower case letters while we were at it! Next, I did want him to practice a few letters and make a drawing if he was willing to give it a try! I made dots for him to follow to spell out Dad. He chose to draw daddy and himself too! He really enjoys these Crayola twist crayons. Colored pencil and crayon in one! More sticker peeling fine motor skills practice. I always have few packages of dollar store stickers on hand or even the grocery store has $1 sticker packs. Liam chose cats for dad and had a lot of fun peeling and sticking the tiny mice and then the cats. Liam really enjoys punching paper with paper punches. Some I have our to hard but this one was just enough tension to be able to do it with some effort. I provided him with several colors of paper and he punched several of each. He thought they looked like balloons. He glued each one on and then I encouraged him to draw balloon strings and he made it into a little maze for himself. 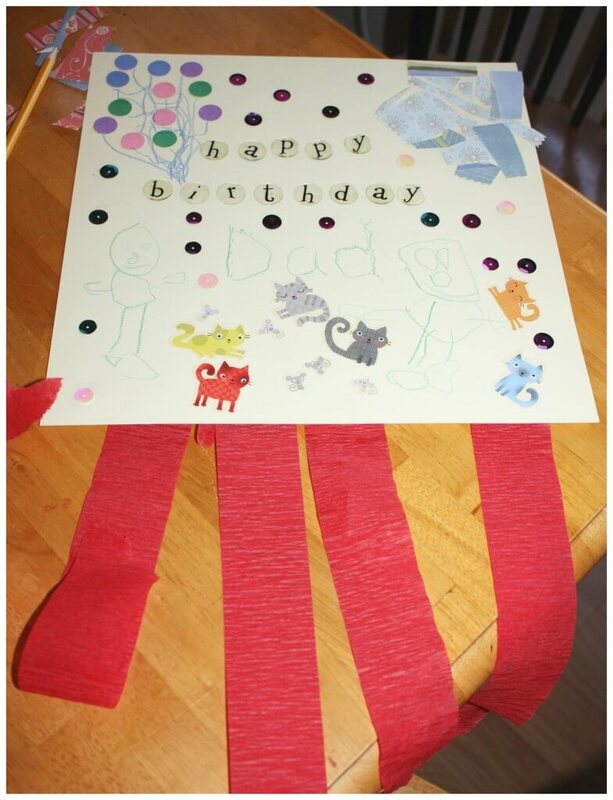 He also used the glue stick to glue confetti all over the card using wonderful fine motor skills to pick up each individual piece of confetti! We saved the streamers for last and worked on tearing off pieces for our final fine motor skills activity. I added some scraps of my scrapbook paper and a pair of scissors to one compartment just for him to practice cutting. If he decided to use it or not it was fine and mostly for the fine motor skills practice. He glued down a variety of cut pieces in one corner! Here’s the finished card! Wait till Daddy sees it! 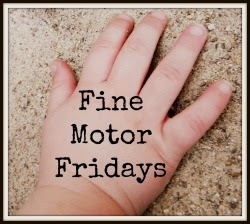 More great fine motor ideas! How fun! What a great card! Awww, so lovely to get him involved. I am sure his Dad will love it! Thanks for sharing these ideas. Its really inspiring and looks fun to make.